Most cases of dry skin are related to partially controllable issues such as dry air and overexposure to hot water. However, you may have a condition called keratosis pilaris if your dry skin patches are limited to your upper arms, according to MayoClinic.com. Keratosis pilaris isn’t a serious health problem, but you may decide to seek treatment if you want to decrease discomfort or improve your arms’ appearance. If basic dry skin is the culprit of the dry patches on your upper arms, your skin may look flaky and red and feel tight, shrunken, itchy and rough. Extreme cases of itchy skin may lead to deep cracks and bleeding. Keratosis pilaris typically has symptoms such as small acne-like bumps, skin-colored bumps that may become inflamed or red, dry and rough patches of skin on your upper arms and sometimes itchiness. Home care steps should help treat dry skin and improve the appearance of your skin if you have keratosis pilaris. For either condition, avoid dehydrating activities such as taking long showers with hot water, vigorously rubbing your skin dry with a towel and using cleansers and lotions that contain alcohol. Instead, take warm showers that are under 15 minutes long, use a gentle skin cleanser, blot your skin dry and immediately apply an alcohol-free moisturizer such as a cream to help seal in the moisture. Drink water throughout the day and turn on a room humidifier to help your body moisturize itself. For keratosis pilaris, you may also want to apply a product that contains lactic acid to help remove excess amounts of the contributing skin protein called keratin, according to MayoClinic.com. Your dry skin should be straightforward to treat with home remedies, but get in touch with your doctor if your efforts don’t result in any improvement, if your dry skin is red, if you are so itchy that you have trouble sleeping, if you have any open sores in dry skin areas or if you have large areas of skin that peel or scale, recommends MayoClinic.com. You may also consult your doctor for a proper diagnosis if you believe you have keratosis pilaris, but treatment isn’t generally necessary. Your dry skin may need professional treatment if it leads to a condition known as atopic dermatitis, meaning inflamed skin. 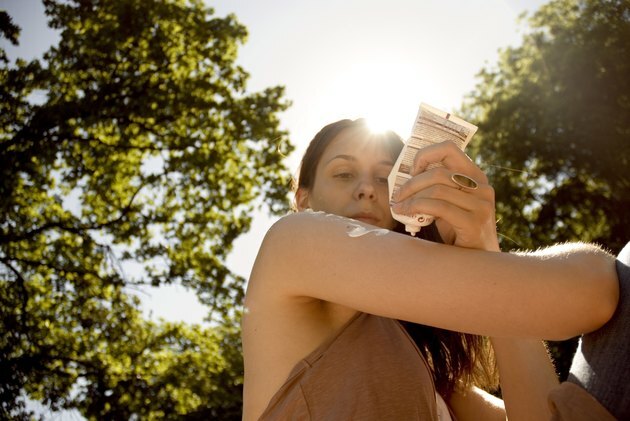 Your doctor or dermatologist may prescribe a cream that contains a corticosteroid or a drug that helps regulate your body’s immune response, according to the American Academy of Dermatology. If your doctor diagnoses you with keratosis pilaris and the condition is causing extreme itching or self-esteem problems, she may prescribe mild peeling agents such as topical retinoids. However, results are generally temporary and you would need to receive repeated treatments for maintenance.